How to view installed programs and software in Control Panel on my Windows 8 system? 1. Press "Windows-R" and enter "Control Panel". You see the Control Panel screen showing up. 2. 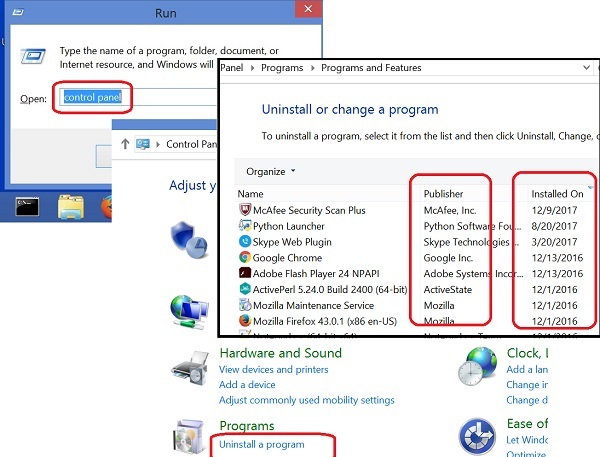 Click the "Uninstall a program" link in the "Programs" section. You see the "Uninstall or change a program" screen showing up with all Installed Programs listed. 3. Review each installed program entry and pay attention to the publisher name and installed on date to help you to determine if it is an old program that need to be updated, or a bad program that need to be uninstalled.